Sometimes – not all the time, but sometimes – you need to have a meal where you feel "sated." Do you know what I mean? Perhaps we just shouldn’t dwell on it. Analyzing pleasure seems to remove some of the enjoyment. 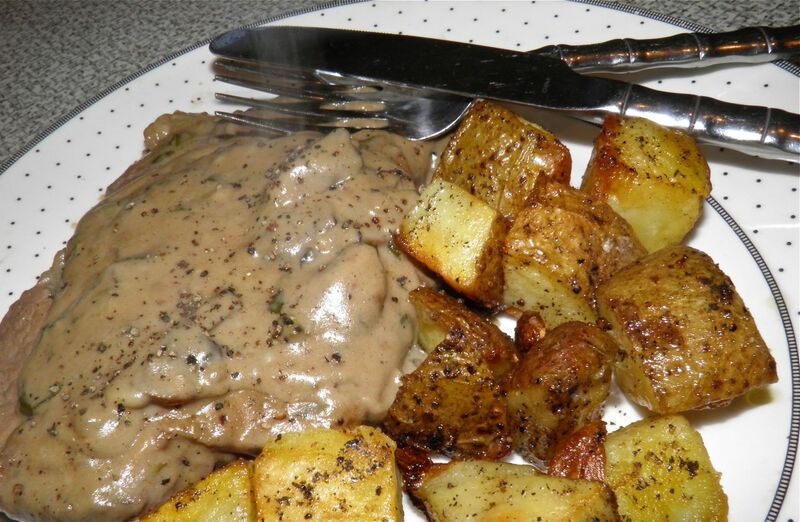 This recipe is extremely easy and not too expensive, if you buy steak on sale. It can be found, especially if you search out the 30% off packages. 30% off means it has about two more days of display time before the store thinks it needs to be removed. Usually the reason is because the surface colour looks a bit different than the "fresh" packages. On sale beef is perfectly safe. If you, or anyone you know, grew up in the country, you know slaughtered animals used to hang for days to age before they were butchered. Sobeys does it and sells at a premium. They call it Sterling Beef. So that can be your gauge for timing this meal with your discount beef. Make it before your mushrooms wrinkle. This is a very satisfying meal. The basil complements the blue cheese very perfectly. If you can’t picture basil with beef you’re in for a pleasant surprise. It all combines into something wondrously delicious. 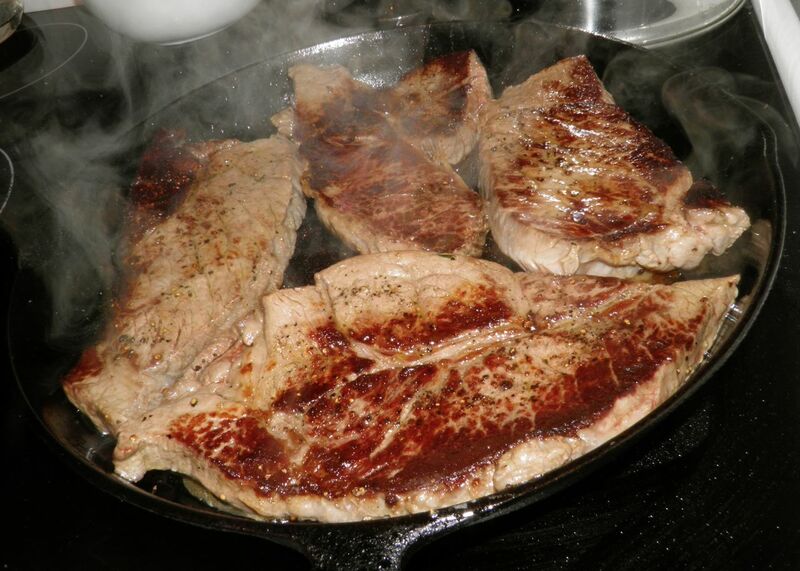 Simmering the steaks in the sauce is a kitchen trick you should know. It transfers the flavour in both directions. Some of the beef flavour goes into the sauce, and the basil and cheese permeates the steak. Now go out and find some discount meat! Make the potatoes first. Preheat the oven to 425°F. Wash and cube the potatoes. Peek and roughly chop 2 large garlic cloves. Place the potatoes and garlic in an oven-proof pan. Add 1 tablespoon of olive oil, some salt and cracked black pepper. Toss to coat the potatoes well. 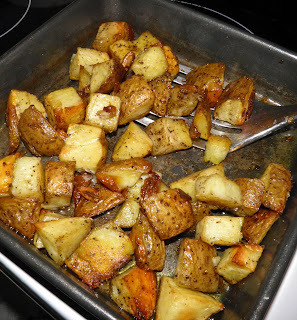 Place in the preheated oven and let roast for 45 minutes to 1 hour. Toss again at the half hour mark. 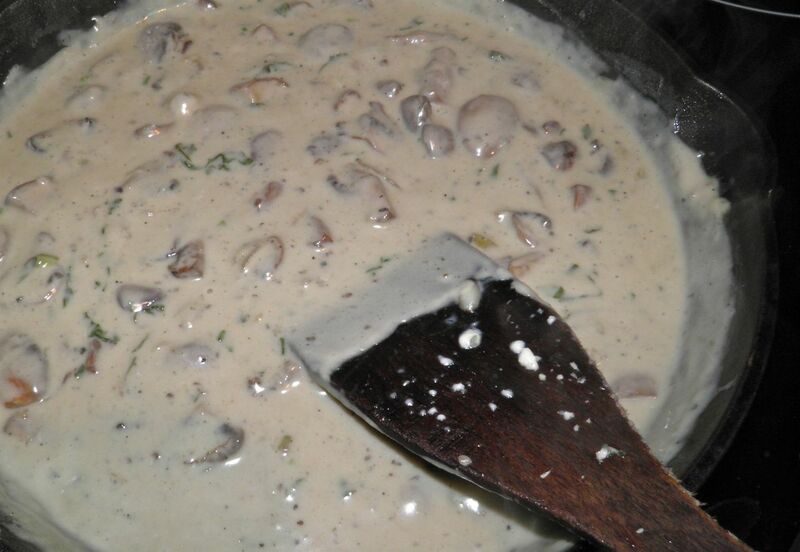 To make the mushroom sauce, quarter the mushrooms, dice the onion and chop the final 2 garlic cloves. Heat 2 tablespoons of olive oil in a wide skillet. 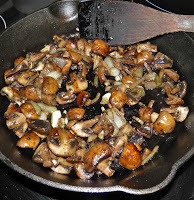 Sauté the mushrooms, onion and garlic until the mushrooms begin to colour. Sprinkle with the flour. Then add the milk, basil and blue cheese. Let the mixture simmer until thick. Then let cook for a further minute. Remove the sauce to a bowl and wipe the pan clean. 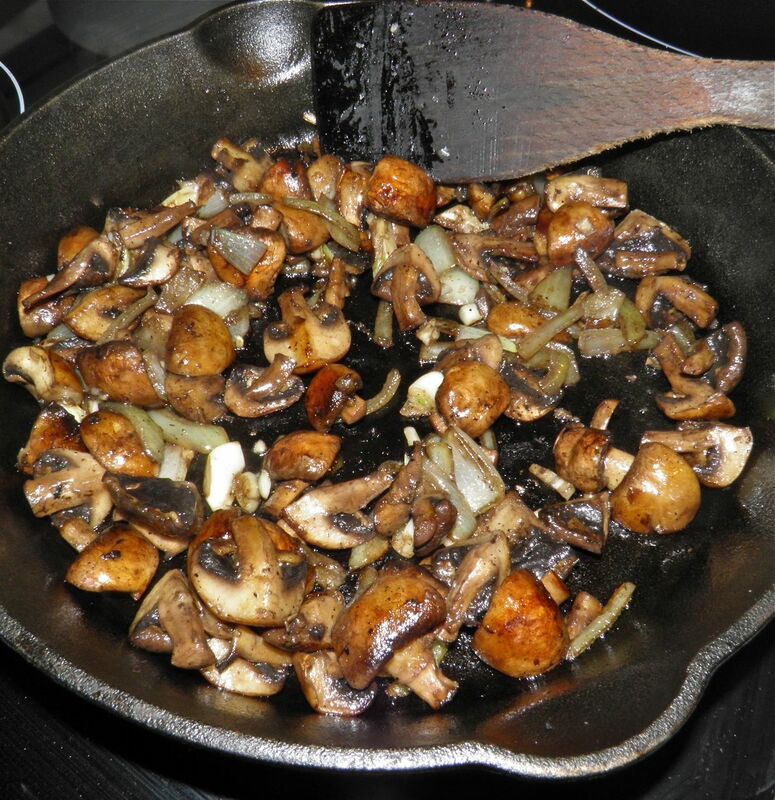 Add the final tablespoon of olive oil to the skillet. Season the steaks with salt and pepper and then sear well in the oil on both sides. The steaks will not be cooked through. Pour the sauce back into the pan, bring to a boil and then reduce the heat to simmer. 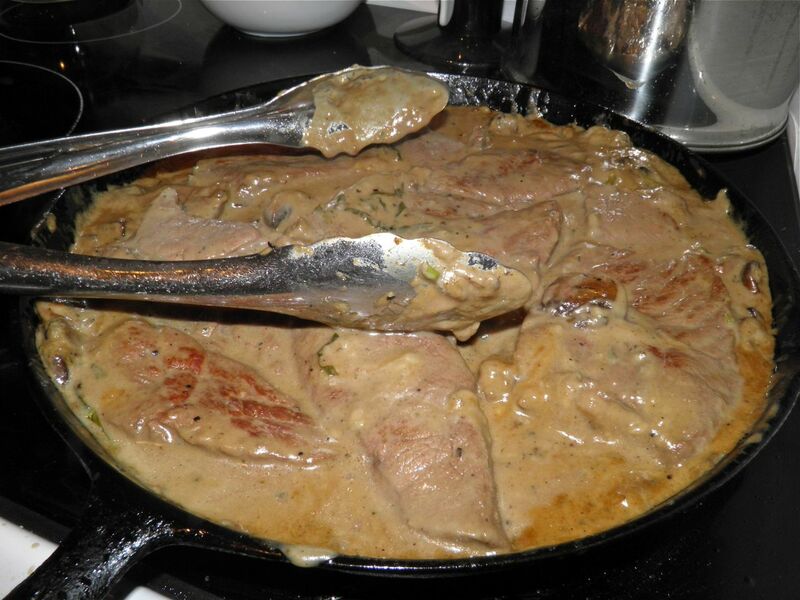 let the steaks finish cooking in the sauce, turning occasionally. This may take an additional 12-15 minutes. Sear steaks and then simmer for 15 minutes on low in sauce to finish cooking. Serve the steaks with the sauce on top and the garlic roasted potatoes on the side.